The metal bar of the bridge has inside a theater hall with dozens of shrink-wrap seats, a coffee and even a space that is used for painting exhibitions. Below, the current of the river. Above, the unwary youngsters that play to cross through the bridge’s arches. Inside the only room, where is close to the national dramaturgy, current referents of high-quality theatre. Refresh the tables of the capital is part of the mission that the actor duet have as a proposal, that summarizes the feeling of turn 20 years in a “we are happy”. Francisco Ossa and Freddy Araya are the owners and administrators of Teatro del Puente, a unique space that place the tables above the river that traverses Santiago. After 20 years of administration, in which they are responsible of the last 13, they have been successful in building a distinguishing mark in the scenario that is planned as a mediation among emerging companies and the crowd. Why this place is used as a theater? 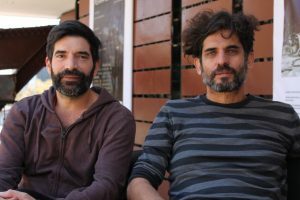 Francisco Ossa (F.O): This started in 1998 together with the Sombrero Verde theater, that is in charge of Caioia Sota director of the Company with Willy Semler and Boris Quercia; they were looking for a space and were working in the Casa Amarilla behind Mapocho river, and in a way of recover this bridge that was the former Pionono, that was moved to this location in 1984, they presented a project to turn it into a theater. I like the idea of space recycling and the bridge as a ameaning, which we have repeated many times, but in the end this theater becomes a bridge for new Chilean companies, a bridge to other bigger theaters, a bridge to a greater crowd, a bridge to a better broadcast, a bridge that makes possible to know these new artworks. We are interested in the crowd that is coming every day, the crowd that buys their tickets to enter and watch a piece once or twice a month, not in those that just come to a party. What changes have you had in the exhibited line? Freddy Araya (F.A. ): We have not had many changes really, we always thought that this was going to be a space for the most emerging companies that at that time used the spaces as warehouses, abandoned houses and, precisely, the idea was to use the bridge that was in a place much more accessible and technically enabled to be a much more comfortable space for companies to present their work. Also that could improve access to the public and from that place we have always maintained the curatorial line, what happens is that at the beginning, when we were just beginning, we evidently worked with people closer, with friends who had their projects and were more willing to show their work in a space that was just beginning to put together. We were just restructuring it, we still had not even technically equipped the room, and we had not made all the changes we made afterward. Then we strengthened that curatorial line and it became our mission: to work with the new national creations, with the companies that are in formation, with the new texts, the new dramaturgies. F.O. : I join Freddy’s words. What happens is that now it is more normal to have decent theatrical spaces, although it sounds weird, I think that 13 years ago when we took the theater, there were few theatrical spaces for young companies that were worthy. 13 years ago we also included ourselves as actors, because at that moment, companies, public, and actors were installed in quite unworthy places. That is why it is fundamental for us to install the Teatro del Puente as a comfortable space, both for companies and for the spectator. In that, we have been all this time, along with the editorial line that Freddy said. How have the crowd been changing that attend the theater? F. A.: The public is growing, by the curatorial line that we normally have our public varies between 18 and 35 years, which is a fairly young audience. It is a public quite linked to the arts in general, we do surveys every year to define the profile of the people who are coming to see our programming. I think it’s an audience that stays fairly faithful, it’s already a much more informed public. Many have formed here as spectators, have begun to come to the Teatro del Puente and already understand much better which are the keys of contemporary theater, which are the dramatists, the companies. Obviously it is a much more informed public, that if they come to a season already know what we were talking about when we talk about contemporary theater, what we talk about when we talk about experiencing the performing arts and, also, many already know the works of companies They are here, they follow them from other places. Or, if there are remontajes, they already know perfectly who it is, or if a director or a company is a second time, they have already seen other jobs and are much more informed. Yes, we have a very direct relationship with the public through social networks and yes, there is an audience that not only come to see a work but come to the Teatro del Puente, because they already know, and we have comments like “yes , I’m going to see the Teatro del Puente programming because I’m interested in what’s happening there “and sometimes one piece may like it more than the other, but it’s also the risk we all run when we’re working with new creations, with creations that are in process, companies that are just forming. A lot of people, and our audience, like that, know a job since its genesis. For them, it is also very important to be aware of what is being done, what is being created, gestating in terms of new theatrical languages. In which way are you celebrating these 20 years of Teatro del Puente? F.O. : Being with the theater open, we talked about it at the beginning of the year with Freddy: “in what way are we going to celebrate these 20 years?” We would have loved it, if it were a big space, invite everyone but we are a small space and there would have been a lot of people outside. We believe that the best way to celebrate is for the Teatro del Puente to remain open to the public, we hope to celebrate the same next year and so we go every year, hoping to celebrate the year that follows. F.A. : There is something that has to do with the event, we are used to the event and many times as that celebration becomes something very fleeting, which does not have much impact on the life of a space. We are interested in celebrating this way, to be still alive and to continue with the programming. And we do not need to make the economic, technical and all that means to make a great celebration, that is, if we are celebrating 20 years and we are going to have a party or something has to be worthy of what we are celebrating. We are interested in the public that is coming every day, the public that buys your ticket and likes to come to see a play once or twice a month, not the one who comes alone to a party. This is the only theater in the world that is above a river. What can you highlight of these 20 management years? F. O.: For what we are going to name some works, that would be unfair, but you can highlight companies that you see later in other theaters, directors who are already working on giant projects, dramatists and dramatists recognized, highlight that there are works of this theater that are going through regions or outside the country. It is possible to emphasize the effort that there was, not only of the team of work of the Teatro del Puente, but of all the people who support this management, all the public that has always been supporting that this scenario exists. This is the only theater in the world that is on a river. I also emphasize how we have been part of the improvement of the environment, which also worried us when we arrived at how this space was transformed into a space of light, and not in that obscure it was. The environment was improved; there is life, when a space is full of life … that’s why when the room is full everything shines and it is thanks to the people who have passed through these 20 years. F.A. : There are several projects that were developed here that today are a benchmark of the national theater, for example, this was experienced with the re-release of HP / Hans Pozo de Barrales ten years later, people who had come to the first season arrived, because they wanted to see it from new. In addition, theater students who knew the work only reference. These milestones indicate that interesting things happen here. Another reference is the number of projects we receive each year, we receive a hundred and many annually. All those people who want to be in the Teatro del Puente, for many it is a priority to be here, that is also an achievement. F.O. : What one expects as an actor is that people leave the theater and the experience does not end there, that it does not end with applause but ends when it becomes a topic of conversation. I think the play does not work when you go to have a beer afterward and end up talking about something else. If it touches you in any way in the days after you have seen the show, then mission accomplished. A.: Because to do theater is something inherent to the human being. It is like a primitive need to express oneself, to get away from everyday life and see reality from another place, from the fiction of what you want, from poetry, from poetics. And the theater, rightly, offers this great instance, this repercussion that it has in the spectator, of generating not only in the social-political issue, there is also an aesthetic act there that is super important. 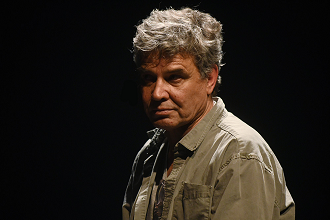 The work of the theater is not only a theme, but how that theme is presented, how it develops on stage from the dramaturgy, from the design, the music, everything, how I create a space, an instance, a moment of attention, of intimacy, of connection with what is happening there. The 2019 call of Teatro del Puente has an only date of reception of projects on Friday 16th, November.